Yahoo is offering an exclusive premiere of an hour-long movie The Monsanto Years. 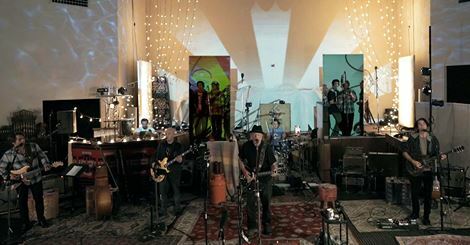 Last week, Neil Young released The Monsanto Years, an agribusiness-themed concept album and a unique collaboration with Willie Nelson’s sons, Lukas and Micah, alongside Lukas’s bandmates in Promise of the Real. Now Yahoo Music is proud to premiere the accompanying The Monsanto Years film, which documents the recording of the album’s nine tracks at converted movie theater Teatro in Oxnard, Calif.
Young’s Rebel Content Tour with Promise of the Real kicked off Sunday, July 5. Each tour stop will not only include a solo acoustic set by Young plus a full electric set backed by POTR, but also “The Village of Action,” featuring information booths for local, national, and global activist groups — thus tying in to The Monsanto Years’ theme of sustainable farming, as well as other environmental and human rights issues important to Young and POTR.